Mahoe Falls (pronounced "ma-HOE") is one of the most beautiful waterfalls I have ever encountered and is considered a centerpiece of Coyaba Garden. 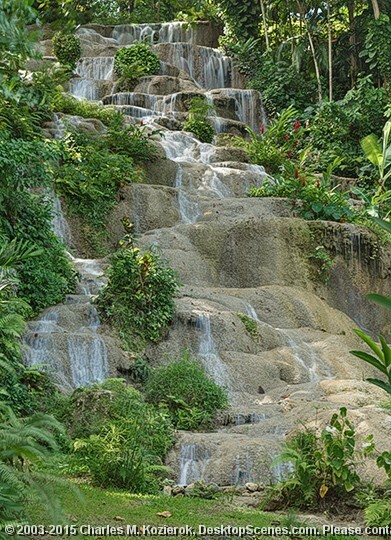 Like the more famous Dunn's River Falls, it too is made of travertine rock built up slowly by the limestone-rich water that cascades over it. The fall actually has many sections, of which this is the largest and most commonly viewed. The stairstep-like quality of the falls reminded me greatly of Mammoth Hot Springs in Yellowstone National Park.